You must make bookings at least 5 minutes in advance of the time at 1901 Restaurant. Nearest parking at NCP car park on the London wall street nearby. £3.00 per hour and motorcycles are free. The 1901 is the perfect setting for your perfect wedding or a special date celebration with all your friends and family. We are prepared to accommodate all types of events from gala dinners to award ceremonies, from fashion shows to filmings. 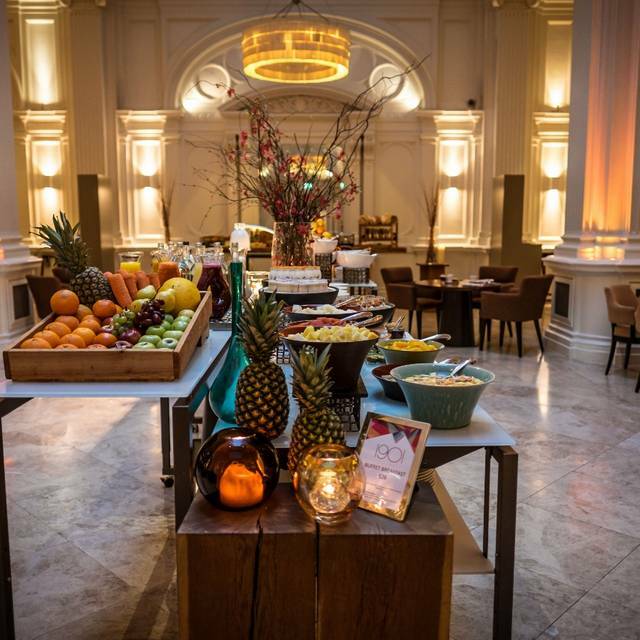 Contact our Events Team on 0207 618 5618 or pde.londonliv@andaz.com. 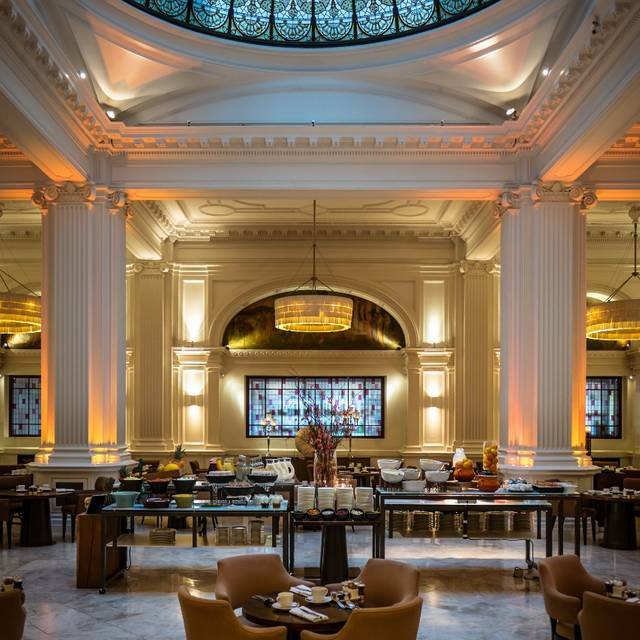 Enjoy a refined and relaxed breakfast in the well-spaced luxurious setting of the Grade II-listed interior of 1901 Ballroom at the Andaz London featureing its original stained-glass domed ceiling – one of the only 2 in the UK that survived both World Wars. 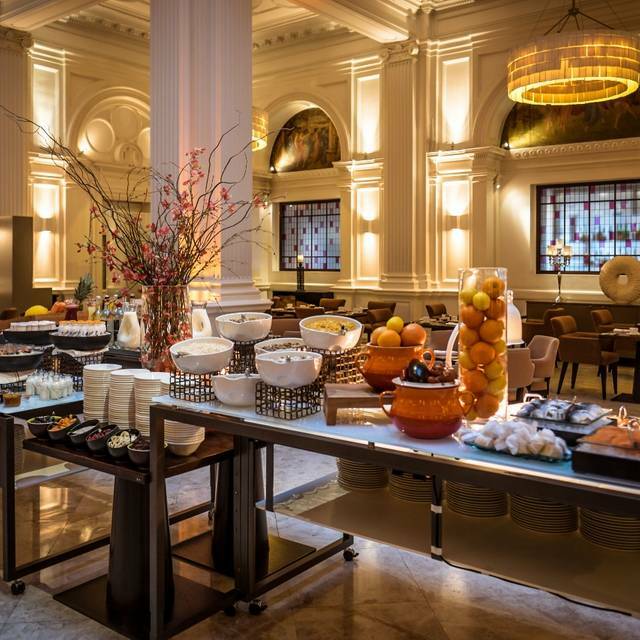 The Buffet Breakfast follows Andaz Liverpool Street’s philosophy “sophistication made simple”. Food is classically prepared, beautifully executed and delivered with style. Taking inspiration from fresh and local ingredients, 1901 finds it spirit in the very best of British produce and features premium local ingredients such as cheeses from Spitalfields market and Loch Fyne smoked salmon, and a large variety of homemade bread and pastries baked every morning. Select your choice of eggs cooked to order or indulge in specialty dishes prepared a la minute, and start your day with freshly squeezed juices, Italian Musetti coffee or a selection of luxury hand-picked Chinese JING teas. This place is great if you want to have a business breakfast (what we had). The food is nothing special: very basic buffet with normal stuff (TBH this is what you could find in any hotel buffet for breakfast). Super overpriced for what it is! However, one thing that was great is that one could talk without having to shout over each other. Tables are not next to each other like other restaurants, so you can have a good degree of privacy to talk about business. Also the music is not loud which is great when you want to concentrate on important topics on the table. And the tables are of good size so we could put a laptop, notebooks and other devices on the table. Great service too! Staff is always on top of things there. Ideal for a business breakfast, but definitely not for the food. I have used 1901 on a number of occasions as I like the open feel of the restaurant, and the ability have a business conversation without worrying about being overheard. The staff are always polite friendly and helpful. I have never had any occasion to question the quality of the food. Consistently good service and food. I arranged the meeting on the train, booked via Opentable and arrived 10mins later to find I was expected. Very efficient. I have not been here for 6 months and it was as good as I remember. Get the little things right and you always go back & recommend it to others. Standard breakfast buffet. Nothing special. It's a shame that such a grand room is used for your average breakfast buffet. Had to pay for eggs off the menu which was expensive. It's disappointing that their is only a buffet and an extra charge for a la carte. We didn't want a full buffet breakfast and therefore paying £69 inc service for 2 people was somewhat excessive for 4 coffees, scrambled eggs and smoked salmon and a salmon bagel. Used to be a regular here before the refurb but won't be back for breakfast in a hurry!! Saturday night around 9pm huge room very empty of people, that may be the city on a weekend I suppose. Rather cold. Service slightly over the top but thats not really a criticism. Food very average apart from a very nice amuse bouche and rather a good pudding. Cold dishes were served straight from the fridge. Wine list very expensive, over all paid far too much for an ok meal. We were staying at the Andaz hotel & took breakfast & dinner at the 1901. The service was impeccable & food excellent that combined with the restaurant itself being steeped in English history. Outstanding experience all round. Been to this restaurant for a drink before but never to eat. The room is spectacular and the tables are very generously spaced meaning its not noisy and you can speak with clients/colleagues with confidence. The food and choice of wines were spectacular and the service was excellent too. The bill was fairly large by the time we had a bottle of wine and an after meal drink but well worth it in my opinion. I eat out an awful lot and was really impressed with this restaurant. Food at Andaz was great and on a night leading up to the holidays it was not overly crowded. I had the cod and my business partner had the lamb. Both were excellent. This is not a casual restaurant its very upscale and fine dinning. always good for business meals. always good for business meals. always good for business meals. always good for business meals. Delicious food and great atmosphere to have a discussion. Ideal for business meal. Beautiful setting - reminiscent of old railway hotels! After an initial hiatus with drinks - we had to ask for an Aperitif - service settled down and was very good and attentive. Food was a high point. If you want a quiet setting - Saturday evenings are quite good! Booked here for my partners bday. We had brunch before a day out in the city. The service was fantastic and we had both buffet and off menu options. We enjoyed an unhurried meal, spending around 2 hours in the restaurant in total! The staff were attentive in bringing more tea and coffee. The buffet was delicious and the pancakes also amazing. It's pricey at £26 per head plus service charge, but worth the price tag for being in London, the service, beautiful surroundings (in an old Masonic temple) 'all you can eat' element and the tastiness of it all! Lovely for a special treat - we certainly didn't feel hungry for the rest of the day either! Exquisite food and a fantastic environment. 1901 really is a treat. I've been going for some time using a £15 deal that they were offering but sadly they have now stopped it and the price for the à la cart menu is too much for a regular lunch. 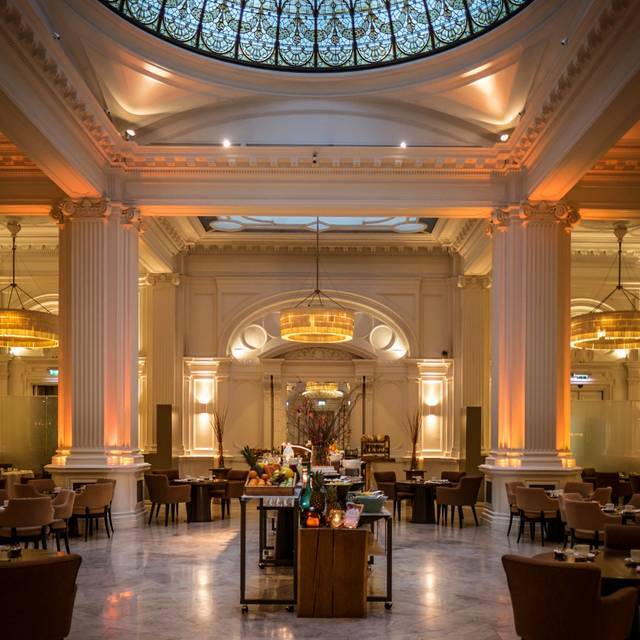 Spacious and classical setting with a welcoming atmosphere. Food was very good although "rare" turned out to be "blue", so take care when ordering. I love the peaceful and comfortable atmosphere that here and that it is therefore easy to talk - unlike all the brasseries around about which are so noisy. I usually both have the British Bento box. It is sort a mini tasting menu and just lovely. It makes for a lovely (not heavy) lunch. Even the bread and butter is fab with special flavours for both. Service is very attentive but not in your face. Lovely, thank you again and again. It was a very decent lunch with a separate vegetarian menu which we found a bonus. The dessert was nice but the options could be better. Portion sizes are decent. Drinks menu could also be more varied for non alcoholic selection. Got the set menu 3 course for £26. I didn't like the entree much, but it was more than made up for by the main dish and dessert. The lamb main was the best lamb dish I have ever had! Highly recommended. We had the business lunch which was excellent value, £26 for a large fillet steak and sides plus a glass of wine. The venue is beautiful and the staff were excellent. We would definitely go back, it was one of the best meals out I have had for a very long time. Beautiful venue that gives a real sense of occasion, great for a special night out. Attentive staff. Particularly enjoyed the flavours in the goats cheese and radish starter. Very enjoyable evening, great atmosphere, service & delicious food. Would definitely recommend. It was my first time to Andaz 1901. We were 2 couples. The location, decor and ambience was pleasant and enjoyable. We had a deal on the food and the options were good. The food and the service was to be commended. Another wonderful meal at 1901. The service is great, from very knowledgable staff. Fresh food, delicious, very varied and also unusual. 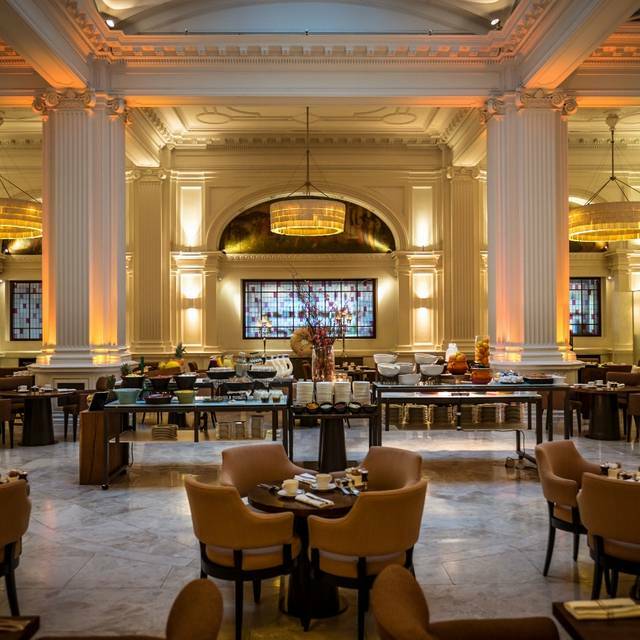 The dining room is stunning, and we alway feel special when dining at 1901. I went their for a business lunch for a client of our and was delighted with the whole experience. The restaurant itself is stunning, the staff were attentive and the food was tasty and I thought very reasonable value. (£52 for 2 people aka £26/head). We had the British Bento Box which came with a duck salad, broth, fish and pigeon dish. Delicious! Lovely setting - special without being too formal. Service was friendly and efficient. Food was fresh, flavoursome and nicely presented. We really enjoyed our dinner at 1901 at Andaz. The food was exquisite, with the added bonus of a surprise amuse bouche before our starter, and a surprise palate cleanser before dessert, making the 3-course set menu seem to be five courses. The service was excellent, just the right balance between being attentive, but not disturbing us too frequently. The restaurant itself is in a beautiful setting, with large domed glass roof, - spectacular. Highly recommended! My table was booked for 11:30. We got there 7 minutes late due to a train delay. As soon as my and my partner sat down, a waitress informed us theyre closing the morning buffet and the room in "15minutes". Why have an 11:30 slot, that I fail to understand. A waiter moved us next door to a far less glamorous room where they sat us next to a window overlooking a building site... The service from one of the female waiters was insulting. We couldnt leave as we booked 1901 2months in advance. A male waiter took over her role as i was extremely unsatisfied with the overall service. The male waiter was much better in terms of being more friendly and ordering the correct meal. Having poor service, we still had to pay a service charge though having horrendous service at the Lverpool St. branch in London. These are my main reasons why I wouldnt dare to reccommend 1901 to anybody. Went for a family meal and we all had the 3 courses for £26. Food was really nice - I had salmon to start and sea bass for main., both cooked to perfection. I especially liked the bread and butter - which was whipped. I had icecream for dessert which was noting special but my Mum and sister had panacotta which they raved about. My boyfriend and Dad also really like their choices. The venue is amazing - nice domed window at the top and a nice atmosphere.. Overall it was a very relaxing evening. This is a lovely 'hidden' restaurant. Not publicised from the street or well known. It is very grand inside, a beautiful large room. I believe it was the old ballroom in the old South Eastern hotel. Service is very traditional and professional. We had the Open Table set menu (2 courses for £26 with complimentary desert). Only a choice of 3 starters (one meat, one fish, one veggie) and similarly 3 main courses to choose from. But they are exquisitely presented with unusual flavour combinations. A really amazing experience. I have been here a number of times with guests and they have always been impressed and excited by the food. Wine is not cheap, with the basic house type wines still at around £30+ a bottle. Fantastic service from all the staff, very attentive without being overbearing, I would recommend the lamb and the seabass, reasonably priced good wines, wonderful room but just a little quiet.